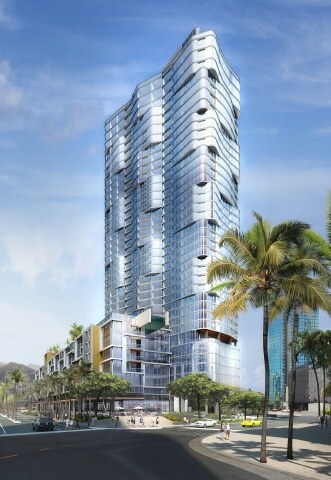 The Howard Hughes Corporation® announced today the topping out of Anaha®, the second residential condominium tower to be completed within Ward Village®, its 60-acre urban master planned community in the heart of Honolulu. With Anaha’s opening in the summer of 2017, Ward Village will continue its transformation into a vibrant walkable neighborhood that offers a range of exceptional residences with incredible island and ocean views and a diverse collection of dynamic retail experiences. Due to these unique features, Ward Village has contracted to sell over 1,100 homes to date, and Anaha is currently more than 90% pre-sold. A collaboration by award-winning architect and design firm Solomon Cordwell Buenz, Honolulu-based Benjamin Woo Architects and global design leader Woods Bagot Interiors, the building was designed to capture the reflected light of the Pacific Ocean and celebrate the beauty of the shoreline. Three residential buildings are currently under construction and five are available for sale at Ward Village offering a broad range of options and lifestyles in the walkable community. Contracted sales at the community have reached approximately 90% for the 493 homes in its first two luxury condominium towers, Waiea and Anaha. Construction began on Ward Village’s third tower, Ae‘o, in February 2016. At completion, Ward Village will deliver more than 4,000 new residences in a market where supply continues to fall short of demand for new housing. Anaha will offer 244 studios and one-, two- and three-bedroom tower residences as well as 73 low-rise flats and townhomes. Wraparound views span from the beachfront to Diamond Head and from Kewalo Harbor to the sunset in the west. The ground floor of Anaha will also welcome Hawaiʻi culinary pioneer Peter Merriman as he opens his first Oahu location of the highly-regarded Merriman’s restaurant in the summer of 2017. Along with the relocation of Oahu’s only Nobu location to Ward Village and the highly anticipated opening of the flagship Whole Foods Market in the base of Ae‘o, the community will become Honolulu’s premier outdoor shopping destination and a gathering place for residents and visitors. As the largest LEED-ND Platinum certified development in the country and the only one in Hawaiʻi, Ward Village is at the forefront of sustainable community development and will contain public amenities at a scale that no other development in Hawaiʻi offers. These public amenities include a planned four-acre park in the heart of the community, new tree-lined sidewalks and bike lanes and access to the adjacent Kewalo Harbor, which is now operated by The Howard Hughes Corporation under a 35-year ground lease with the State of Hawaiʻi, with plans underway to upgrade the harbor’s existing infrastructure for recreational and commercial vessels alike. Kaka‘ako was recently named by Trulia as the top neighborhood with the best amenities in cities of under one million people.